Located about a ten minute walk along the canal from the city centre, this 23 ha vacant site was entirely in public ownership - shared between the Canals and Rivers Trust, HCA (Homes England) and Birmingham City Council. Together they commissioned URBED and DTZ to secure planning consent on the site for ‘a high-quality, family-oriented, sustainable and mixed use waterside neighbourhood’. Permission was granted in October 2012 and in 2015 Birming City Council annouced Urban Splash and Places for People as development partners. The key question we addressed in the masterplan was how to bring forward the site in a manner befitting its importance at a time when the market has no appetite for innovation. This created a gap between the land owners’ aspirations for a high-density exemplar development (which was nevertheless viable) and the market’s desire for something more traditional and low density. The significance of URBED’s masterplan is the way that it has sought to resolve these requirements. The SiteIcknield Port Loop is a key site in the history of the canal system. The Loop in question is James Brindley’s 1769 canal from Birmingham to Wolverhampton which was built on the 450’ contour to avoid the need for locks. This did however lead to it being described by Thomas Telford as little more than a ‘crooked ditch’ and in 1827 it was bypassed by Telford’s Mainline canal (top right of the plan) making the central part of the site an island. The body of water on the left of the plan is the reservoir built to serve the mainline canal, and which has been a place of recreation for Birmingham people ever since. The area around the canal was developed for industry forming a barrier between the more affluent suburbs to the north and west and the inner city district of Ladywood to the south and east. As the industry declined and relocated it became part of a major area of opportunity. The Big City Birmingham is seeking to grow its population significantly over the next fifteen years. To this end it is planning to build 50-60,000 new homes within the city. The Big City Plan developed by Urban Initiatives sets out a framework to achieve this. After the city centre the largest concentration of new housing is to be in the Western Growth Corridor, at the heart of which sits Icknield port Loop. 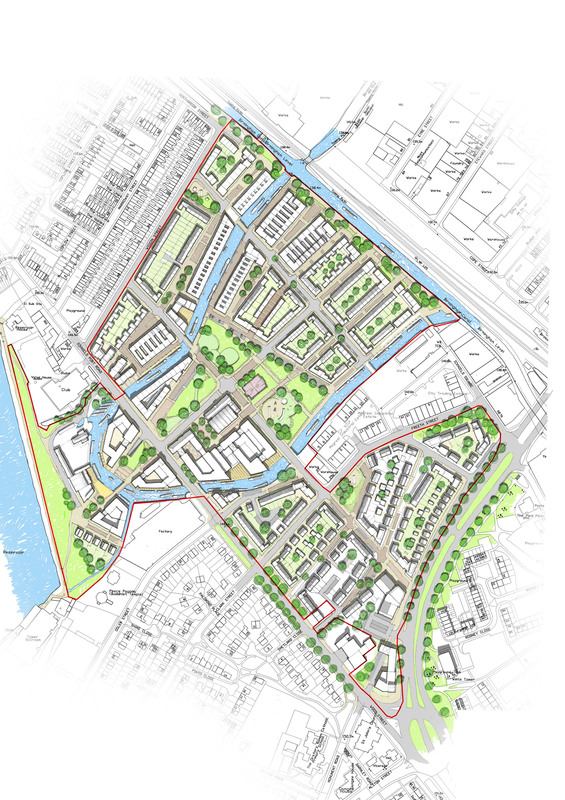 The plan envisages the Greater Icknield Area being developed as a Sustainable Urban Neighbourhood (based on the model developed by URBED in the 1990s) with 6,000 new homes. 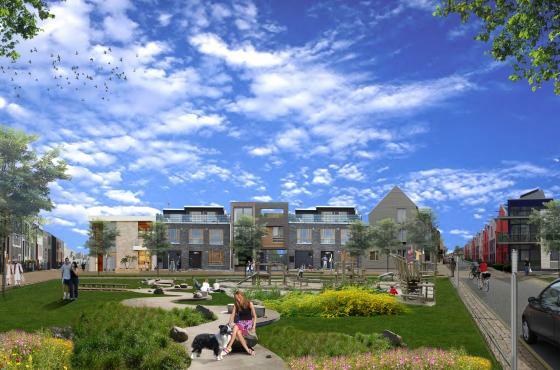 Density, Innovation and Family HousingThe Greater Icknield framework envisaged 1,700 units on the IPL site with housing density bands of 70, 120 and 180 units per hectare (u/ha). These proved very difficult in a market where apartments were no longer seen to be viable. Much of URBED’s early work was therefore based on a study of density typologies, using examples from the UK and Europe to illustrate that high densities and innovation were not necessarily synonymous. The conclusion was that 70 u/ha was the highest density possible without apartments. As a result of this work the City agreed to drop the highest density band and to allow the 120 u/ha zones to be allocated to later phases of the scheme. The majority of the masterplan is therefore designed to be 70 u/ha with a first phase of 40 u/ha to allow an early start. This reduced the site yield to 1,000 units. Ironically when the scheme was considered by committee, one of their concerns was the suitability of the 70 u/ha housing for families. 1. The neighbourhood centre: The creation of a local centre where Icknield Port Road crosses the loop. This includes a mix of uses and the higher density housing. 2. The central park: All the open space requirement is gathered together in the heart of the site. The park creates view corridors to the canal in three directions as well as the dam. 3. The canal: There was much debate over the canal character. The masterplan seeks to replicate the historic character by which buildings rise sheer from the water. There is also a strategy to create a variety of residential and visitor moorings. 4. Sub neighbourhoods: The site is split into four sub neighbourhoods each to be developed by different developers and with different characters. 5. Stitching: The masterplan is designed to ‘regrow’ the existing street network to stitch the site into its surroundings. The Regulatory PlansThe concern of the planning authority throughout was that the ambition of the illustrative material would not be followed through into the scheme. Meanwhile DTZ were concerned that an overly prescriptive consent would limit market interest. The consent is therefore structured around a set of regulatory plans defining densities, massing, access, parking open space and waterside uses. The planning submission includes a great deal of work on the 70 u/ha density band which is regulated across half of the housing development land. The illustrative material shows how this could be developed with a range of innovative courtyard houses, but is also achievable with more conventional housetypes. Lessons Learnt There has always been a gap between the aspirations of local authorities to promote innovation and the concerns of the housebuilding industry. Since the recession this gap has widened to a gulf. The inevitable temptation, at a time when the priority is to achieve housing numbers, is to dumb things down, to accept more ‘traditional’ types of development. Birmingham is clear that it is not prepared to do this. The main lesson of the IPL scheme is that it is possible to achieve a mid point between an aspiration for dense, quality, mixed-use development and a market that is currently suspicious of such things. It achieves this, not so much through the plan, but rather through a carefully negotiated set of parameters and a pragmatic approach to the development process. The aim is to build momentum with a first phase which does not scare the market, but which establishes the location and development values, allowing the higher density phases to follow. This places a great deal of pressure on the masterplan as a tool to give the City confidence that quality can be maintained, to sets parameters for development and to create briefs for each of the future phases. As such it is an example of how pragmatic modern masterplanning can respond to the current economic climate. Icknield Port Loop was featured in the Birmingham Mail on Saturday. Please click the link to read the full story. The paper featured one of the images URBED produced for the Design & Access Statement. The others are also shown below. The proposal is currently awaiting a decision for outline planning permission. 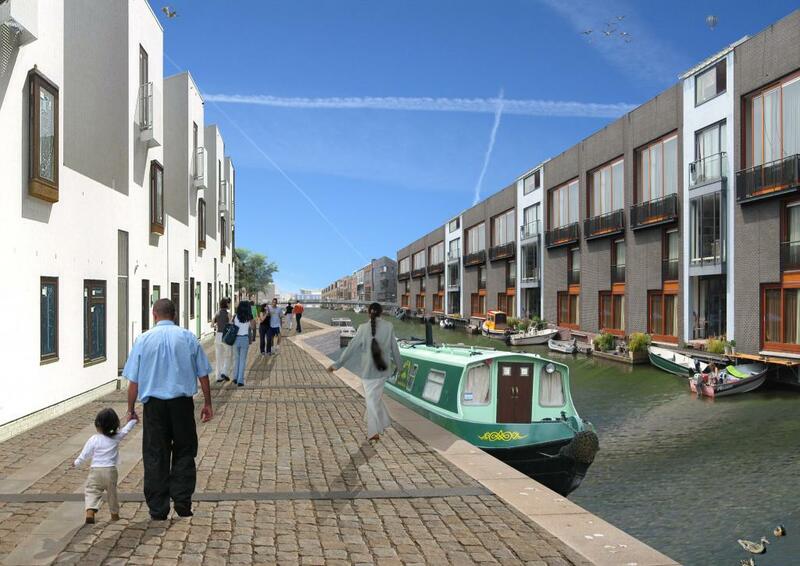 Above: View along the canal showing the proposed housetypes. Above: View accross park to housing with frontage on to the park. Several buildings will be kept on the site and one will be turned into a new community sports facility. The masterplan has now been submitted to Birmingham City Ceouncil Planning department for outline planning. The masterplan is decibled in the Design and Access Statement, available to download. 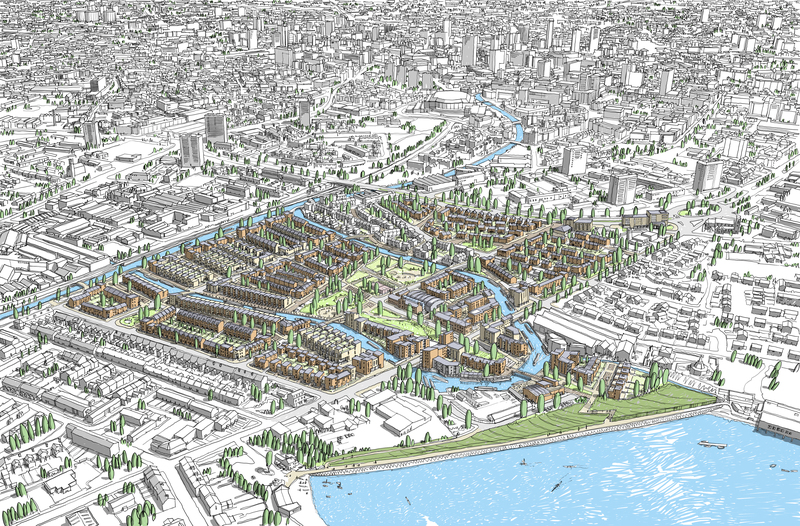 This illustrative masterplan includes land use, massing, access, public realm and the waterspace strategy. The entirety of this document is illustrative meaning it shows how the scheme could be developed in line with a planning application. It is however an outline application and the content of this statement goes beyond the scope and detailed to be fixed at the outline stage. Over the past few weeks we have been undertaking a public consultation of the masterplan for Icknield Port Loop. The proposed scheme was drawn up and illustrated with exemplar images to engage people in discussion about the kinds of developments that could take place, the types of housing they prefer and canal-side activities they thought the area could sustain. Many people asked questions which were answered by members of the client and design team. Overall the feedback on the day was very positive, with the majority of people stating during discussions with the consultant team that they couldn’t wait for the improvements to start, as this would ‘lift’ the area. The results of this consultation can be seen in the Statement of Community Involvement which will become part of a planning application.